Well, I've discovered what our science focus will be for my soon to be 8 year old son this year. My father-in-law is visiting for a couple of weeks. He brought a model airplane to make with Julius. Problem is, the kit was quite old and the directions were missing. (I found the manufacturer on line and they are sending directions.) But, his interest was stirred; we had to build a plane, today! "What about those planes I built with Granddad before? Are they still in the basement?" So, I spent the next 2 hours helping him build the AMA Cub. Bill a.k.a. Granddad had bought a package of 40 five or six years ago. Although Julius didn't help build the plane at that time, it stayed with him. This time he actually did a fair amount of the work himself receiving pointers and cautions from Granddad and physical assistance from me. 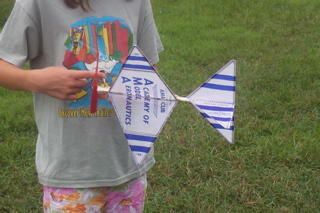 In about 3 days we had as many planes; only one had been lost to the street (car + balsa = no plane). 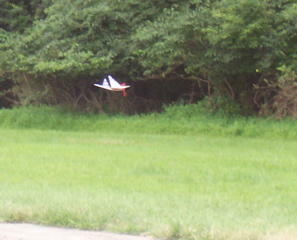 After breakfast on Saturday, we headed out to the model airplane field at Valley Forge. It took some patience on the part of all the children (okay and me too) to trim the planes, that is, get them so that they actually fly for more than 3 seconds. Put on a little clay, take off a little clay. Wind it up for 100 turns, not enough, try 150. There were several successful flights, successful enough that Dad had to take the kids out for more flights in the evening. These planes will circle upward and are quite facinating to watch. If you really build it well, you could have a plane up for a couple of minutes - our longest may have been 25-30 seconds. Like all hobbyists I've met, modelers are a friendly bunch, ready to share their wisdom, knowledge and love of their hobby. The Valley Forge Signal Seekers (they fly R/C planes at Valley Forge) were out today and let me know about an event on September 10. "Fun Fly", a kind of community demonstration day run by their club with activities for the kids. So, now I find myself surfing the web, in search of more rubber power models to build, how to optimize performance of the AMA Cub and where there might be free flight modelers to watch in our area. I know it is just a matter of time before Julius has built all 40 models or tries to think of ways to fancy it up - I've got to stay one step ahead or find someone who already is; Granddad is only here for another week! Hey, I just noticed that since I organized my site the link you have to it is wrong.